Domremy College is committed to addressing the individual needs of students and creating opportunities for each student to realise her full potential. In recognition of this, new and innovative approaches are being explored to ensure that learning can be tailored to better meet the personal and differing needs of each student. Domremy is a Newman Selective Gifted Education Program accredited school. The Newman Selective Gifted Education Program incorporates best practice in the provision of personalized learning. The target group includes students who have been identified as highly capable. Significant resources have been allocated to the provision of programs and opportunities to meet the diverse needs of students in every stage of their schooling. This includes provision for students who have been identified as academically gifted or highly capable. Important elements in personalising learning for students are the rigorous and comprehensive processes which identify the strengths and needs of students to their learning. The Newman Selective Gifted Education Program explores a range of instruments, addressing multiple criteria, to assist teachers in the process of identifying the needs of students. These include student performance data, teacher recommendations and external testing. Research a clear framework for the most effective instruments to identify the individual learning needs of students. Create opportunities for teachers to work collaboratively across the range of subjects in our school. Engage students in work that is appropriately challenging. Develop thorough and effective processes to ensure that approaches to learning address the personal needs of each student. Develop innovative, research and evidence based teaching and learning strategies. 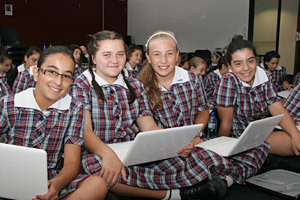 Please visit the Sydney Catholic Schools website for further information about the Newman Selective Gifted Education Program.